A plan to consider only the first 20 applications for six family court magistrates has been accused of compromising the diversity of the bench and stoking a "crisis in quality". Transform Justice fears the recruitment process for vacancies in Birmingham and Solihull could perpetuate a system dominated by white, middle class people over 50. The charity said magistrates must reflect the public they serve. Capped applications opened on Monday. The Ministry of Justice (MoJ) said the aim was to interview three applicants for every magistrate position available. The lawyer and author behind the Twitter profile The Secret Barrister compared the approach - which has been dubbed "first past the post" - to "winning a holiday on Teletext". "And we wonder why there's a crisis in the quality of the magistracy," the tweet continued. Other courts in England are applying caps, although the maximum number of accepted applications varies in line with the amount of magistrates required. 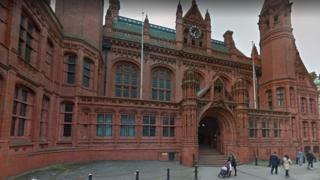 Under the approach in Kent, a similar push for 25 magistrates to sit across three courts is described by the area committee as "first come, first served". Penelope Gibbs, director of Transform Justice, said she had been raising the issue of capping since 2014. "The issue is that there is already a lack of diversity in the magistracy. It is predominantly over 50, the BAME percentage is not representative of the population, it is overwhelmingly middle class. "If the first 20 applicants you get are all white, over 50 and of the middle class, that is your pool. "Magistrates are supposed to be representative of the people and if it is not, it is not fulfilling what the magistracy is supposed to be." Image caption Transform Justice says for justice to feel fair "magistrates need to be representative of the people"
She added the capping helped those "in the know" with easy computer access and no childcare difficulties. "If you are working on the tills at Tesco, you can't say 'I'm just going to take 10 minutes off to apply'." The Magistrates Association charity posted notice of the Birmingham roles on Twitter. A spokesperson said including people from all backgrounds with different life experiences was vital. "Anything that discourages people from applying could potentially affect this, which is one argument for having clear timeframes for applications rather than a first-past-the-post system." The MoJ guidance reads: "The important aim is not to waste time and resources in interviewing a disproportionately large number of candidates for the number of vacancies." Asked whether the policy limited diversity, a spokesperson said a new drive for more judicial diversity had been introduced but was not aimed at magistrate recruitment in particular.